» What Is Bi Amping? What Makes It Different From Bi Wiring? What Is Bi Amping? What Makes It Different From Bi Wiring? There’s a question we’d like to answer: is it worth bi-amping your speakers? This article will give you a closer look at how bi-amping improves the sound quality with different aspects, as well as how to customize your home audio installation and recreate that kind of powerful and “live” listening experience. For those who don’t have any idea about bi amping, we’ll give a general insight into “what is bi amping?” as well. So, let’s get started right now! Bi-amping or bi-amplification is a common technique that is used to separate the signal so that the low frequencies go to one amplifier while the high frequencies go to the second one. It enables users to benefit the real powers of each amp in contact with the speaker and help you enjoy a clearer and fuller signal. However, not every model is able to support bi-amping, so you need to check the manual instruction or look for more information on the ‘Amp Assign’ menu available in the receiver to check the status. Bi-amping could improve the quality of sound when our home theater handles more sequences of audio. Once your audio setup is bi-amped, each sector of the speaker draws from its source of strength, making the emitted sound gain less constrained than before. Therefore, one of the biggest benefits of a bi-amp system is the audio quality enhancement. By separating frequencies between two amplifiers, you’ve got a chance to double the sound power. This addition means the ability to retain the low-end definition and the clean mids & highs at the same time. On top of that, you can get yourself an active crossover to separate the audio signal from the mixer with ease. The most popular range split is about <=350Hz for your subwoofer and >=350Hz for your loudspeakers. How come? It’s due to the certain amount it often takes to drive things below it. Based on the system and your preference, you can split those frequencies at various ranges. In detail, feel free to divide the frequencies at 250Hz if you find the range of 250-350Hz is better from your high or mid speakers. They’re completely different ways to configure your speakers to one amplifier. But they’re often mistaken. That’s because both of these systems use two sets of cables from the speaker to the amplifier terminals, so to bi-amp or bi-wire one system, your speaker needs to own individual terminals for the tweeters and the woofers. In addition, such terminals should have one jumper bar that acts as a connection between the treble and bass sectors of your speaker for basic running. 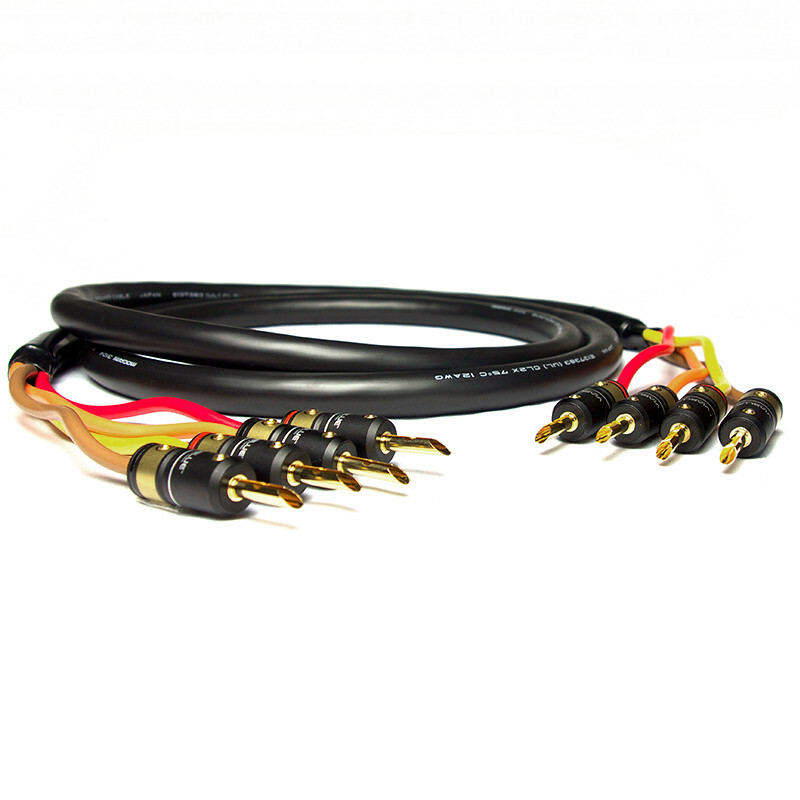 For bi-wiring, each speaker is linked through two sectors of speaker wire from the receiver amplifier to both treble and bass inputs of your speakers. For bi-amping, it requires one electronic crossover to separate your audio signal from one pre-amplifier. This is done before your signal reaches the amplifier phase. And we can’t deny the classic bi-amping method since it’s very important. It helps to control the movement of the driver, lower the distortion, and raise the amplifier strength dramatically. When it comes to bi-wiring, it mentions how to divide the wire running from one common amp output to two other various inputs on the same speaker. Also, your speaker needs to be specially designed with the bi-wiring and has two sets of binding posts linked by the removable jumper bars. How to Bi-Amp a Speaker? To bi-amp a system, the strength of your amplifier needs to get balanced out, especially your speakers – they should lie within the frequency and power restrictions. 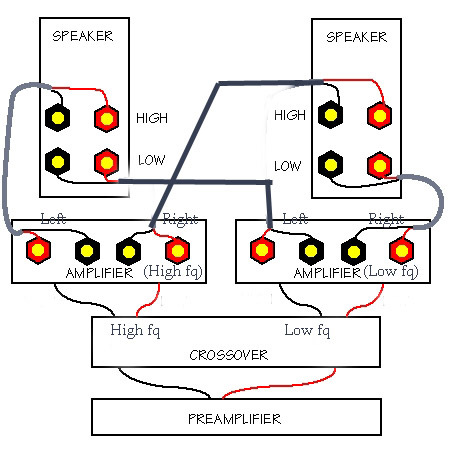 The whole process would involve hooking each amplifier to an electronic crossover that can replace the passive crossover system built in your speaker. At this point, remove the passive crossover so that you get to accomplish the benefits of the bi-amping method. And such a dynamic crossover would link to suitable terminals. For example, one for the woofer while another one for the mixed mid & high-range frequencies. Ensure to follow the similar procedure for linking low-frequency amp outputs to lower network of terminals. Always remember to keep the right wiring polarity in every connection. Also, take a careful look at the manual to prevent making other minor mistakes for the bi-amping process. Be certain to test the receivers’ capabilities before making any further effort. However, if bi-amping or bi-wiring speakers is not what you like to do, how about connecting the amp with a set of binding posts, instead? Now you’ve got the answer to the question “What is bi amping?” It’s a way in which you configure your speakers to an amplifier. Doing so will power the woofers and tweeter together as well as enable two amps to sound better than ever! After bi-amping, don’t forget your listening test at last. Last but not least, bi-amping is more expensive than bi-wiring since the second technique does not ask you to split amps or any electronic crossover. So, make a wise choice between these essential and creative ways to give your space a potentially better sound. what is b stock ?